Turtle Bay Condos on beautiful Manasota Key, the jewel of the Florida south coast barrier island. A small and delightful enclave of only eight lovely Old Florida style two-bedroom units, with lanais, individual washer and dryer, propane BBQ grill and our own security encrypted high-speed wi-fi available in all units and common areas. With Lemon Bay at our private dock for your boating or fishing pleasure, our lovely pool surrounded by mature coconut palms and lush tropical landscape and gulf sands of the six-mile Englewood Beach, virtually at your doorstep, via our beach. Turtle Bay Condo is your island paradise that you will surely come to time and again. Take a short walk south to the newly developed facilities of the main beach or to gulf view restaurants featuring fine foods and of course, the famous and gorgeous south Florida sunsets. We own all eight condos at Turtle Bay Condos and have 'pride of ownership'. As owners, we offer a personalized service and vesting that you will not find with a management or real estate company. Our goal is for you to arrive and immediately feel that you picked the right place to vacation. Our units are immaculate, fully furnished and offer everything to make your holiday stay enjoyable. We are rated #1 for vacation rentals on Manasota Key by TripAdvisor! Manasota Key is an enchanting barrier island off the coast of Englewood where there are no high-rises, no traffic lights, just a two-lane road and miles of pristine beach. The beach offers pristine sand, amazing shelling and almost a sure find for shark teeth! You will not find the crowds on the beaches that you will find on other Keys. Turtle Bay Condos is located directly across the street from the beach. We direct you to an easement away from the public beach access which will take you one minute from your front door to the beach! You can walk right up the street for your choice of several wonderful restaurants. The best part is there are no tolls for either bridges that access the island and you are only two minutes over the bridge to Englewood for all your shopping needs. You can fish right off our private dock or just sit out and relax enjoying the views. Our pool is heated year round for your comfort. Sofa bed, seating for 6 people. Dining: dining room seating for 6 people. Secure, encrypted wi-fi, flat screen TV's, expanded cable, DVD, CD. There is golf in the area. Notes on accommodation: Telephone, air-conditioning and central heating provided. 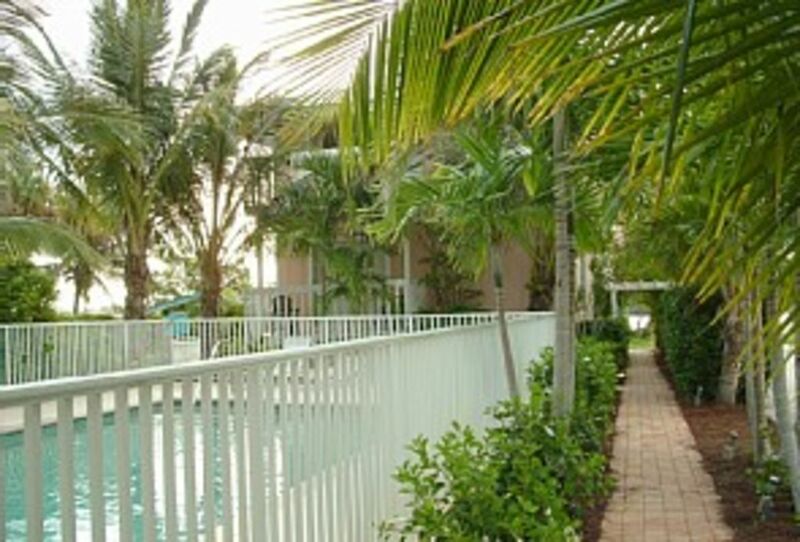 We have a gorgeous heated pool and are located on Lemon Bay with our own private dock. We are directly across the street from the beach and minutes from local restaurants. There is never a need to get in your car! Outside: Heated pool. Garden, terrace, barbecue, parking, balcony. Utility Room: Iron and ironing board Cleaning / Towels / Linen / Maid service: Towels and linen provided. Property is immaculate upon arrival. Other: 32" flat screen LCD HDTV with expanded cable & DVD player in living room plus a 19" flat screen LCD HDTV with expanded cable in the master bedroom. Swimming, tennis, walking, sailing, cycling, fishing, golf, wind-surfing, water skiing, paragliding, roller blading, shelling, shark tooth hunting. Beach is directly across the street. Manasota Key is surrounded by six miles of pristine beaches and gorgeous Lemon Bay. Southwest FL Int'l (RSW) or Tampa Int'l (TPA) at 50 miles. Nearest motorway: Interstate 75 at 10 miles. Car recommended although you will not need it once you shop for your groceries. Restaurants are only a few minutes away and an easy walk. Our condo is fully furnished (self-catered). It includes all cooking utensils, pots and pans, toaster, blender, coffee pot, iron and ironing board, vacuum; everything you may need to make your stay more comfortable. We have a private boat dock and do not charge extra fees to dock your boat. We do not have facilities to leave your boat trailer but can refer you to the next door neighbor for a nominal parking fee. Manasota Key is located across the bridge from Englewood. We are close to Venice, Port Charlotte, Punta Gorda and Sarasota. Beach combing, fishing, boating, walking, lounging by the pool and enjoying the local restaurants are the favorites pastimes of our guests. Want to visit Disney World in Orlando? We're just 2.5 hours or approximately 148 miles. Booking Notes: $200.00 refundable damage deposit; no separate cleaning fee. Changeover Day: Flexible. Notes on prices: Prices are for the property per week in US Dollars. Discounts given for multiple weeks. Our rates are flexible and we're happy to accommodate two day bookings depending on availability and season. We have one unit, #1-D, that has two baths which is $75 more per week. #1-A is our designated pet friendly condo. We do NOT allow cats, large breeds or dogs that shed. A $300 Refundable Damage Deposit is required for this condo. CANCELLATIONS: A sixty (60) day notice is required for cancellation. Cancellations that are made more than sixty (60) days prior to the arrival date may incur a $100.00 penalty. Termination of this agreement for any reason within the 60 days of the start of the rental period, will result in forfeiture of deposit and rental monies paid. All charges are assessed in US funds. Failure to pay rental monies due by above dates could result in cancellation.